Just like so many things in our children’s lives, learning spelling is developmental. Once you know what the developmental levels are, and what level your child is on, you no longer have to worry about if they are behind or right where they need to be. When we have our children, it begins. The constant comparison to other children. From who is holding their head on their own, to who is sleeping through the night. Eventually, that turns into who is reading at what grade level and when. Comparison seems to be the name of the game for a lot of parents. The truth is, just like all of those adorable first milestones are developmental and they will come in time, the same is true for spelling ability. I don’t understand why so many people (both parents and educators) think some magic switch gets thrown at 5 years old making the child ready for school and for formal academics! We’ve talked before about how reading and literacy is developmental and most children aren’t entirely ready to read until they are about 7 or 8 years old, but some are as old as 9 or 10. The same is true for spelling. 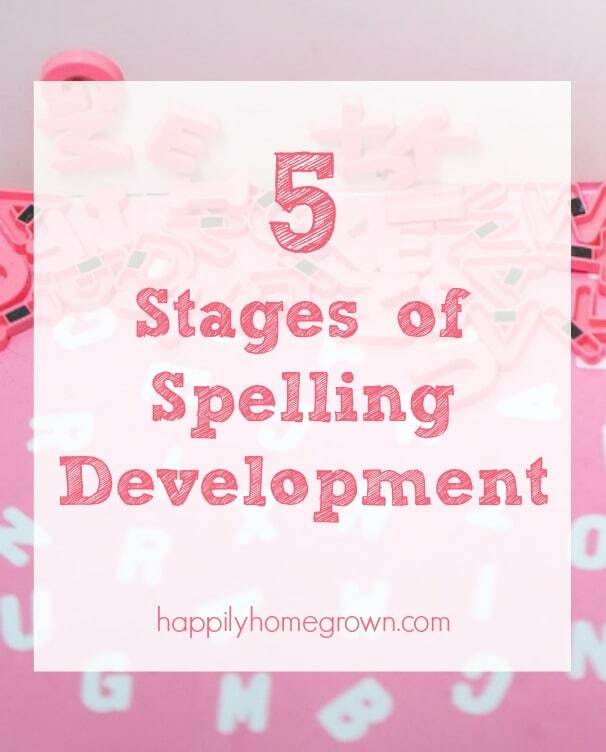 There are actually five stages of spelling development: Emergent Spelling, Letter Name Spelling, Within-Word Pattern Spelling, Syllables Juncture Spelling, and Derivational Constancy Spelling. This stage is typical of children who are 3-5 years old. During the Emergent stage, children learn to make the distinction between drawing and writing. You may notice that your child will show you a piece of paper with scribbles on it and then tell you what it says. This is very early spelling even though there may not be a single letter on the page. Children in this stage then learn how to make letters and distinguish between them. They will learn which direction you write on a page (left to right, top to bottom). They will also begin early phonemic awareness, recognizing that certain letters make certain sounds. By the end of this stage, children are realizing that letters represent sounds in words. This stage is typical for children who are 4-9 years old. This wide five-year span confirms that not all children will learn at the same pace. During the Letter Name stage, children begin to represent the phonemes in words with letters. Early Letter Name spellers, may often write only a few of the strongest phonemes to represent the word. Children at the beginning of this stage my write D for dog, or KE for cookie, identifying only the strongest sounds in the word. This “kid writing” or “kid spelling” as it is often called is developmental and so important for our young learners. As learners move through this stage of spelling development, they will begin using the beginning and ending consonants in most words and will begin to include a vowel in each syllable. 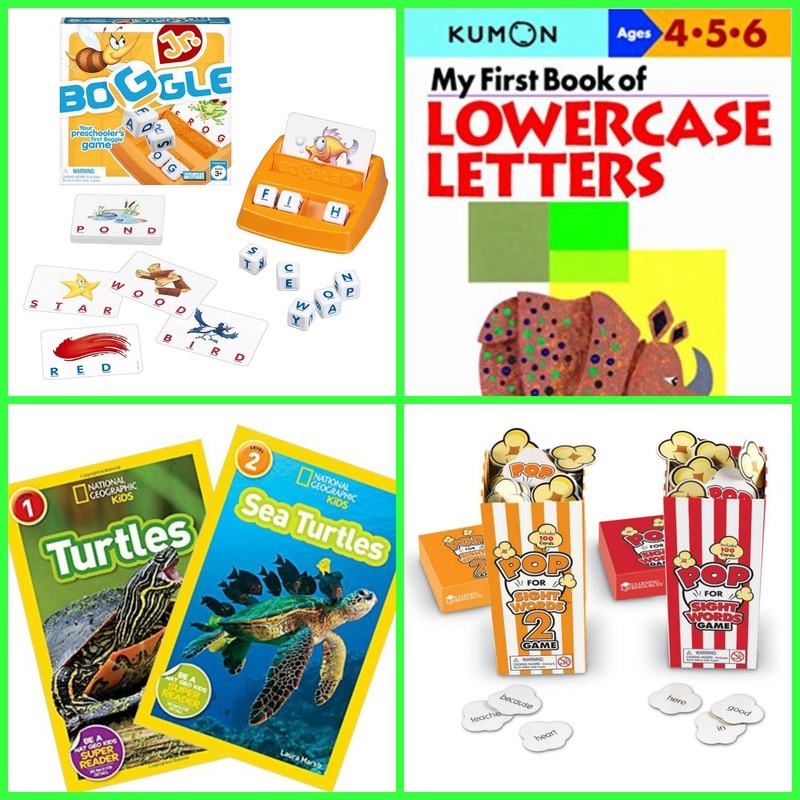 They will learn word families and can spell multiple words, even those unfamiliar to them, using the patterns they recognize from the word families. This stage is typical for children who are 6-12 years old. Learners have moved on to the Within Words stage of spelling when they can spell most single-syllable, short-vowel words correctly. During this stage of spelling development, children will learn long vowel sounds and patterns in single-syllable words. They will also learn more complex consonant patterns containing three letters (for example -tch as in watch), as well as less common vowel patterns. Learners will also become aware of homophones. By the end of this stage, children can read and write many words correctly because of their knowledge of letter sounds and short-vowel patterns. This stage is typical for children who are 8-12 years old. During this stage, children take what they know about letter sounds and short-vowel patterns and apply it to multi-syllable words. They will also learn inflectional endings (-ed, -ing, -s, -es), and rules about doubling consonants, changing the y to an i, or dropping the final e before adding suffixes to words. Homophones and compound are also taught during this stage of spelling development. Additional prefixes and suffixes are also introduced to students. This stage is typical for children who are 10 years old or older. During this stage, children learn that meaning, as well as patterns and sound, are important in spelling words in the English language. Greek and Latin roots and affixes are taught, bringing a level of vocabulary study into the spelling lessons. Learners explore the relationship between spelling and meaning and learn to associate word meaning even when vowel sounds change from the root word (for example wise – wisdom). This is the final stage of spelling development continues through adulthood with how we continue to learn new words and language. Children’s spelling ability is developmental and you can not force a child to move from one stage to another with rote memorization or skill and drill practices. Many spelling programs that are used today are very good with following the early developmental stages of spelling, which is great for 1st and 2nd grade students. Unfortunately, classroom teachers are often told which resource they must use at each grade level, so come 3rd grade students may have a spelling list that is outside. Some schools allow for teachers to differentiate instruction for all learners using whatever resources they believe are necessary. Luckily, during my classroom teaching experience, I worked in two school districts that allowed the classroom teacher to differentiate spelling for each student in our class. Over the next several posts, I will share what I used for teaching developmental spelling in public school, and what I use to teach developmental spelling now in our homeschool. So helpful! I have one son that really struggles with reading, writing and spelling but I have been seeing huge strides in the last year or so. While I will always worry he’s “behind” I am seeing that being patient and meeting him at his level so he’s no frustrated and overwhelmed is helping him so much. Pinned. As a mom, we always worry if our children are behind. One thing that has given me clarity along this journey is talking to my mom about what was considered appropriate skills when I was the age my children are currently. The reality is, our children are not behind but rather the “experts” are pushing our children to do things beyond their developmental level. Just take a breath and know that meeting your child at his level is always the best way to go with academics. I really appreciate how you stress that we need to let our kids’ development shape our expectations for them! When I do, our school day flows smoothly and joyfully, when I don’t, it’s much more stressful. Thank you for the clear and in-depth post. It really reassured me that my 4 year old is right on track and maybe a bit “ahead” in his abilities. I’m so glad you found this helpful. I feel like people stop talking about child development once our children are walking & talking, and don’t look at it in regards to education as well. I hope you have a joyful 2019!